Monday's chart: it's the lending, Eurocrats! Monday’s chart: it’s the lending, Eurocrats! LONDON | Will the trick of cutting the European Central Bank's deposit rate pay off? Everyone had noticed the extremely high levels of cash European banks left with the central entity for a mild profit in exchange of, well, nothing from their part. Particularly after the ECB made liquidity available, via its long-term refinancing operations, it was clear that the European banks would not take their share of risk and effort to reactivate the economic activity. With a zero yield, deposits with the central bank have now turned into a useless exercise. making the right noises. It will not be enough, though. Saying you know troubled banks' recapitalisation must be done without adding to the States' debt isn't the same as effectively detailing how the bailout funds will work in reality. Naming the ECB as the pan-euro zone watchdog of a much awaited banking integration isn't the same as explaining the regulations that will ensure the process. 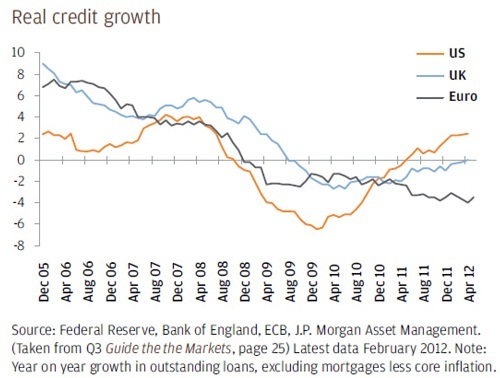 Where uncertainty is tackled, things look a bit brighter, as this chart from JP Morgan asset management research shows.